Settling in Cardiff at the turn of the millennium Madi made the jump from predominantly being a solo performer to that of band leader. The first incarnation, MadDave, saw Madi team up with fellow guitarist and mandolin player Dave Nash. They were joined by Will Mepham on accordion/piano and Martin Davies on electric bass. 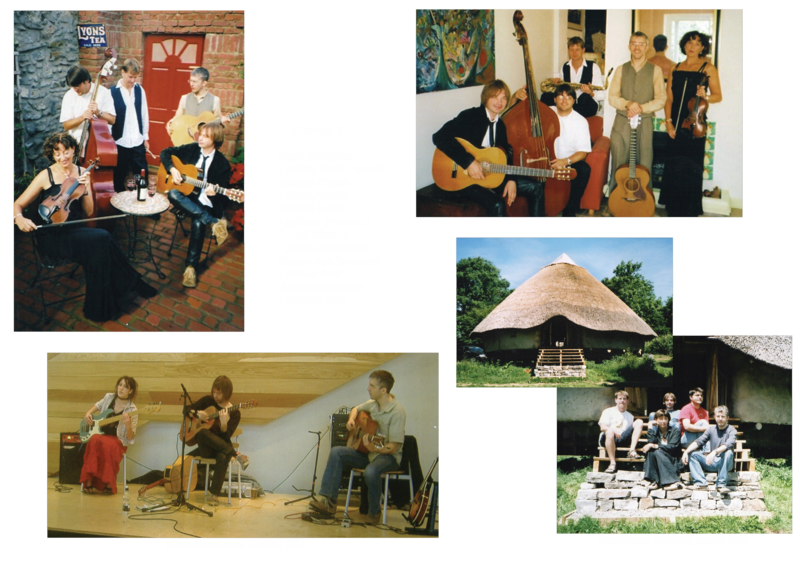 In 2003 Madi set up his band, The Madintentions, playing a mix of acoustic, folk, bluegrass, gypsy and jazz. Influenced in his early career by musicians such as Bert Jansch, John Martyn and Davy Spillane, the emphasis was definitely on folk. The Madintentions was a melting pot of some of South Wales’ finest acoustic musicians. There were however two main line-ups. In 2006 the line-up changed and Madi and Bethan were joined by Gareth Wilkinson on guitars and mandolin, and both Matt Downer and Andy Caughlan at different times on double bass. Unfortunately at the moment there are no pictures of this second line-up in Madi’s archive. Although in recent years Madi has developed a passion for gypsy and jazz music, he’s still in touch with his roots and into 2013 will be incorporating much more folk and bluegrass into his public performances. Blackberry Blossom – Trio version of this bluegrass classic, featuring Madi 9guitar), Vo Fletcher (of the Ric Sanders band) on guitar and Simon Smith on double bass. Jesu Joy of Man’s Desire – Duo version of this sublime Bach tune, featuring Madi (guitar), Paul Smith (double bass). The Entertainer – Trio version of this Scott Joplin piano rag, featuring Madi 9guitar), Vo Fletcher (guitar) and Simon Smith (double bass). Freight Train – Duo version of this Elizabeth Cotton classic country tune, featuring Madi (lead guitar), Paul Smith (double bass). The Entertainer – Duo version of this Scott Joplin piano rag, featuring Madi (guitar), Paul Smith (double bass). Drowsy Maggie – Quartet version of this Irish trad tune, featuring Madi (lead guitar), Ken Moore (rhythm guitar), Geoff Walker (soprano sax) and Marko Miltic (double bass). Captain Pugwash (Trumpet Hornpipe) – Trio version of this fun animation theme classic, based on an old Welsh tune, featuring Madi (guitar), Vo Fletcher (guitar) and Paul Smith (double bass).